I'm not really sure what these things are called to be honest. 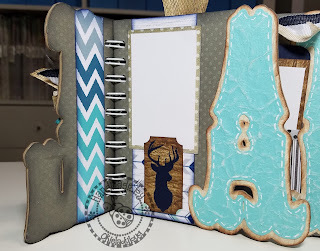 I have seen it called a Word Album or a Name Book and I remember when they were all the rage a few years back and everyone and their mother on the Cricut message board were making these things. I made one for my oldest Goddaughter Ashley not long after I got my Cricut and it was a CHI-OMEGA word book. One weekend my cousin Teresa came down and we made 3 of them for her grandchildren at the time and her daughter Amber, not to be confused with my youngest Goddaughter Amber, loved them. It was actually Amber's idea that I make one for her sister Marissa's new baby Lane. Since Marissa had the baby early Saturday morning my daughter and I opted to wait until Monday to go see her and the baby because I knew the hospital has so many rules and there would be visitors in and out and I wanted some quality snuggle time with little Lane, as did my daughter. I worked furiously over the weekend on the frame that I posted yesterday and then the Word Album that I am posting about today. Now my skills as a paper crafter have improved since making the word albums years ago as has my stash of supplies, tools and machines so this book is probably the most sturdy I have made. Months ago I found some packages of comic book boards at Zipp for like $2 a package and bought them with no certain idea in mind other than it looked like chipboard and I love chipboard. There are 100 boards in a package and are acid free. 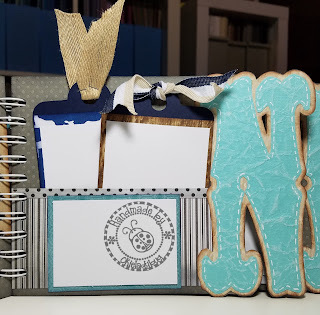 When I went to get chipboard out of my craft closet to make this album I opted to use the comic book boards and the Explore cut them wonderfully! I used the deep cut blade housing and set the dial to custom and then chose the medium chipboard setting. I cut each page 3 times so I could have a good sturdy book, or album *okie is still confused about what to call the dang thing*. With previous books I used tape to put the pages together and such but for this one I used glue and I think it will make it last longer. I used my brayer to go across each layer after gluing them together to help spread the glue and make the layers adhere to each other better. I'm sure you guys know how to make these things and they aren't really hard. The hardest part for me is to figure out what font to use to make the name stand out. I used White Vinegar for the letters and had to break the letter apart and get rid of the pieces that I didn't want that was in the font. I also set a shadow to the letters because I love shadows. Oh yes, I designed it Make The Cut and then exported to SVG and uploaded to the Explore, which I think is probably obvious since I still don't like designing with Cricut Design Space and most importantly MTC has the wonderful shadow feature *okie grins to herself thinking about all the other cool features that MTC has that CDS doesn't have*. 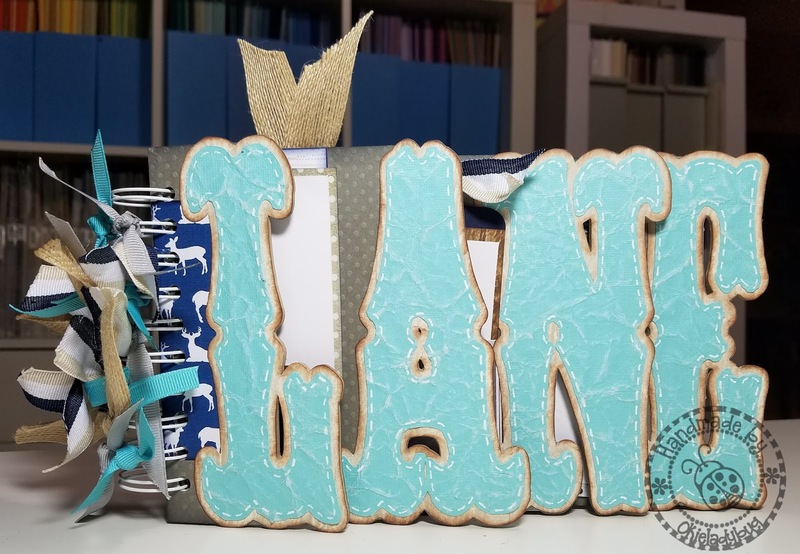 If you can see in the picture the turquoise letters look a little leathery and I achieved that look by spritzing some Coredinations cardstock and then wadding it up into a ball, crumpling it up really good. After I let it dry I got out an Emory board and sanded across the top, giving the paper an even more distressed look. After all that I then cut the letters out with the Explore. The shadow of the letter didn't have anything special done to it other than a little inking. I can rarely find a good way to decorate the back of the first letter in these books so I normally just ad a strip of paper for some decoration. The second letter didn't have a lot of room but there was enough for a space for a small photo. I cut out some deer heads in several different sizes to use through out the album. When gluing the "plaque" down I made sure not to add glue to the top where the white piece of paper is so a photo can go behind the plaque. 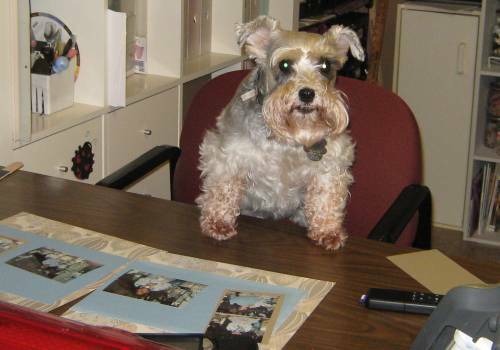 Generally I try to add more than one photo space to a page when there is enough room. Sometimes it is difficult to adorn a page and work around the holes of the letters but a well placed deer head added enough little embellishment to where the page didn't look too plain. I did have to print some paper to use in the album because I didn't have much of anything in my stash of papers that matched the theme or colors. Luckily I did have enough cardstock in the colors I needed. Another way to add extra photos is to make a pocket and put tags in the pocket. 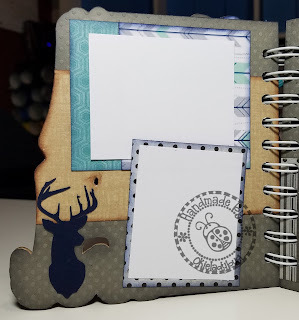 On this page I was able to add two tags and also had enough room on the pocket for a photo. 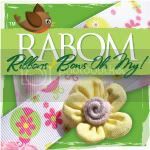 I was able to find ribbon in the closet that was masculine enough to use on the album, which I used not only on the two tags but also on the o-wires. 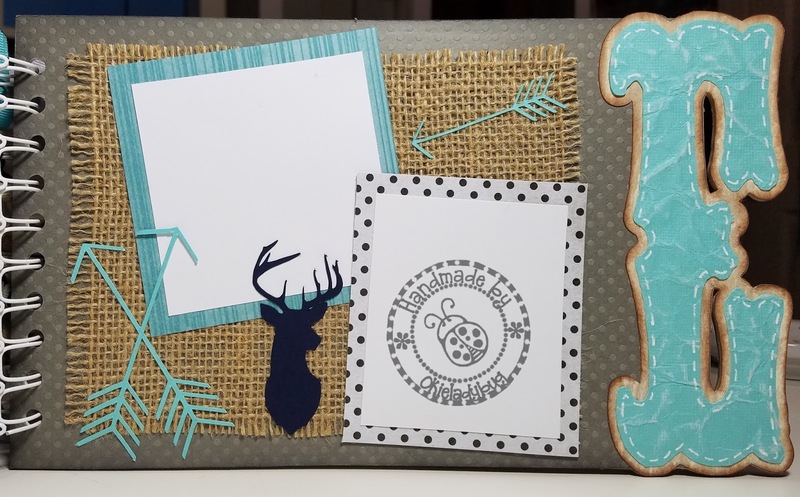 With this page I had to work around the holes of the N and some narrow arrows worked great and once again a deer head was able to add some interest. The deer paper and the chevron paper are some that I printed. I really like the Canon Matte photo paper for this purpose as it grabs color well and can be cut with the Explore and holds up well with being embellished. Why yes people that is a piece of burlap on this page! I did try to tie the book and the frame from yesterday together with colors and theme and I think I was able to pull it off pretty well. I did use Sobo glue to put the burlap down and also the arrows and deer head. I really don't think my beloved Scotch Quick Dry Glue would keep the elements down on the burlap but that Sobo just don't play! 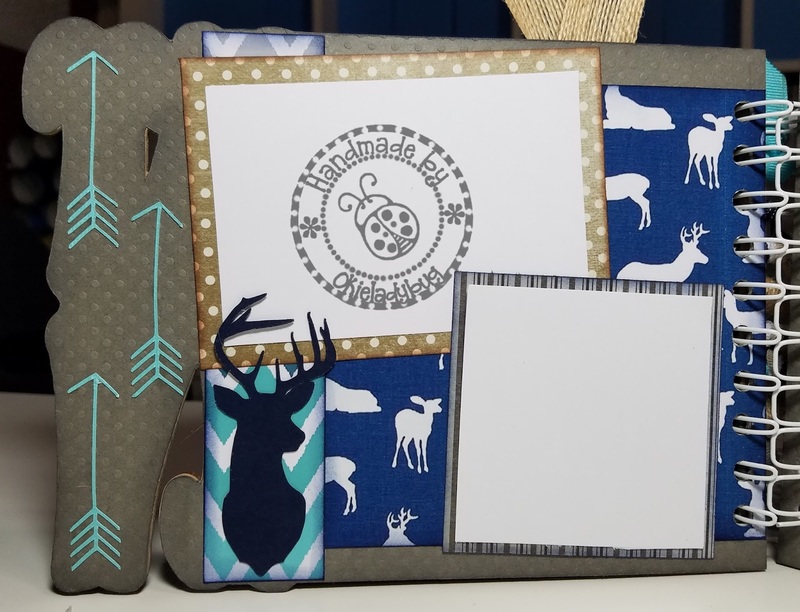 I think I might have gotten back into my crafting groove a bit now and while I am running out of ideas for projects right now I think I can likely walk into my craft closet and find something to create. This book is so dang cute! I also remember when these albums were the rage back in the old Cricut MB days ... and this one would have been a shinning star among them ... Oh HECK, it's a shinning star now! Who knows, maybe you have just brought this style of word albums (or whatever they are called) back into focus and they will become the new "IN" thing to make once again. Beautifully done! Another great project for the newest member of you family, tfs! Great projects. Love the little book. I have made plenty but never cut chipboard with the Explore yet. The frame is adorable, I know she'll keep it forever! This word book is adorable; and I love the color. I love the babies name, I have two great nephews that I took care of from the time their Mom went back to work until they were old enough to stay alone. Their names are Austin and Colton and they are as much my Grandbabies as my two Son's kids are my Grandbabies. So I think you feel this way about little Lane. The best feeling that their is is to be loved by one. The two great nephews that I watched up until I got sick last October still love me unconditionally. Everytime that I go to my Sister's Jaxon and Xavier come running to me and hug my legs and keep repeating"Hi Nana" and I love everybit of it. I imagine this little guy will be the same with you. What a blessing to have little ones in your life. 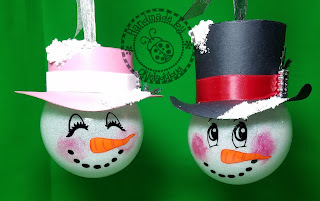 Any way I think this is what I am doing them for Christmas along with my Grandbabies. I had all the stuff bought to make them all big albums but I haven't seen my 4 youngest Grandbabies since Mother's day a year ago. Awesome album!!! Love the colors and embellishments!! Love the frame as well. Such a cute baby!!! Great to have you posting again, it's very inspiring!!! So very cute! I love what you do!